Upon arrival at the Holbox dock, we got off and our luggage was placed on the dock from where it had been stored for the trip. At the end of the dock is a line of golf carts labelled “Taxi.” The ride to the Hotel La Palapa, where I had reserved for a couple of nights on the internet, cost 30 pesos (about $1.60 US) and took about five minutes. There are no paved streets on the island and the population is about 1,200 residents. 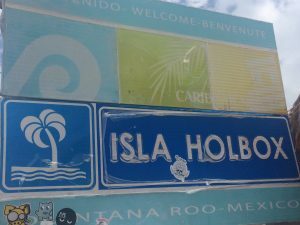 Welcome sign at the Isla Holbox Port. You get a pretty good idea of the island on the ride to the hotel. This is not a glitzy place like Cancun. There are no air conditioned jewelry stores here. 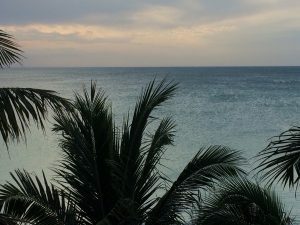 We rented an ocean front room with a balcony so we could have a nice ocean view. The idea was great, but the palm trees had grown up in front of the windows so that there was maybe a “peekaboo” glimpse of the water if the wind blew just right. Gee, I guess there was a sea view years ago, but now it is available only from the roof sun deck. The beds were hard as a rock and I didn’t think I could sleep there, but my Withings health watch said I got more deep sleep on the hard mattress than I got at home! There was an air conditioner over the entry door that would cool the room fairly well if towels were placed on the floor in front of the doors to block the air flow and the bathroom door was kept closed. It was a pretty hotel and the staff was very nice and helpful. We had drinks from the bar and food at the restaurant several times and it was very good. The beach along town was not so good. The pictures you see on-line are misleading. It has a lot of small shells that make it uncomfortable for a tenderfoot like me to walk barefoot on. There also appears to be an erosion problem because there are what appear to be sandbags encased in concrete at many places along the beach. The far east end of the beach around Hotel Nubes is the best beach, but it still has some of the small shell. (It also had what looked like small round jellyfish on the day we were there.) More on this later.